Brighten up your formal look with this delightful men's white satin formal scarf. From its slight sheen to its flowing tassel fringe edges it presents a whimsical, fanciful aesthetic that's perfectly at place with any tuxedo, tailcoat or tuxedo tails, semi formal suit, or other black tie or white tie ensembles . The perfect length for wearing with a knot, tucked behind a jacket, hanged or draped over the shoulders, or wrapped loosely around the neck, it's a great way for any gentleman to add some elegant style for the opera, wedding, formal dinner or other black tie event. SOFT, SOPHISTICATED SHEEN. 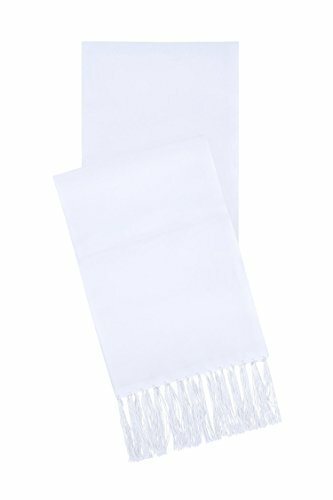 Crafted from a lovely white satin, this men's formal scarf has a subtle shine that will add a little bit of pop to any tuxedo or formal attire. KNOTTED TASSELS. Both ends are finished with a line of luxurious knotted tassels, which gives this scarf an extra burst of classic elegance. PERFECT FORMAL ACCESSORY. When you want to compliment that perfect formal look, our white formal evening scarf is the perfect accessory to show that you have a sense of style for your next black tie event. GREAT QUALITY AND VALUE. No need to spend a fortune to achieve the look you want. Why spend hundreds of dollars on an expensive silk scarf when our satin scarf by S.H. Churchill & Co. can give you the same look for a fraction of the price. This white scarf has the look and feel of silk. FIT FOR A KING. With a one-size-fits-all length, this scarf measures 57" x 7"
Brand: S.H. Churchill & Co. If you have any questions about this product by S.H. Churchill & Co., contact us by completing and submitting the form below. If you are looking for a specif part number, please include it with your message.